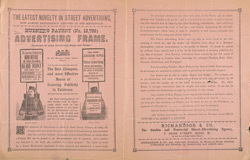 This is an advert for Hubner’s advertising frame. During the 19th Century posters were not subject to the same advertising tax as newspapers and so they were a cheap way of advertising a product. Colourful and striking images could be used to catch people’s attention and firms such as Richardson & Co., would employ men to wear sandwich boards and frames and walk the streets of London so that their posters could be read as they passed by. Dictionaries actually record the use of the phrase ‘sandwich board’ from 1895 but as can be seen from this leaflet the idea was around for a lot longer.